I'm a month late with my Shakespeare post. Forgive me! It wasn't my turn to post in April, but initially I thought it was, so I wrote this. I was extremely fortunate, growing up. I had a mother who loved the theatre and we lived near enough to London to get to the London theatres, which were, in those days, not so unaffordable for ordinary people. My first experience of Shakespeare was on the stage - where he is best enjoyed. I was around ten and was taken to see a Comedy of Errors. I don't think I understood much, but enough to laugh, and I remember a young Judi Dench parading the stage very clearly. But the stand-out Shakespeare memory was the Macbeth production I was taken to around a year later at the Young Vic in London with Judi Dench and Ian McKellan, neither of whom were remotely as well known then as now. It was a small, intimate staging and venue and breathtakingly powerful. I had no trouble understanding this and I think it gave me a life-long love of both Shakespeare and the theatre generally. And I think that when I came to study Shakespeare in school, I was immunised against hating or finding him difficult. Because....Macbeth. It was so real to me. It was also the first play we read in school. I'd encourage any parent who wants their children to appreciate Shakespeare to take them off to see a good production or two before they come across him in school. Standby tickets will do fine! I've seen so much fabulous and not-quite-so-fabulous Shakespeare since, including King Lear and A Midsummer Night's Dream with Kenneth Brannagh and Emma Thompson - outstanding - and Lennie Henry's Othello - interesting - and Tim Piggott-Smith in Julius Ceasar - the whole production was rather dull. Derek Jacobi as Malvolio in Twefth Night - such comic timing! Another unexpected performance was A Midsummer Night's Dream where the actors switched between English and various Indian languages, and some very rude stuff was done with a butternut squash. Trust me to remember that bit. Shakespeare is so many things. But if he can possibly be enjoyed in the theatre, he should be. My ambition now is to attend a performance at the Globe. 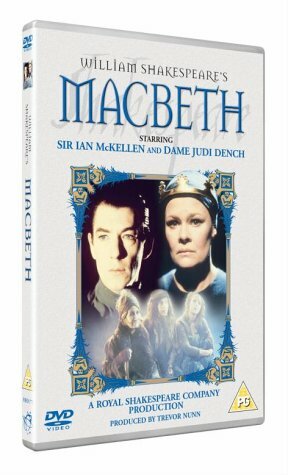 But I doubt that performance of Macbeth will ever be beaten. And The Comedy of Errors was the first Shakespeare to which I took my identical twins! Highly recommend the groundling tickets at the Globe...queueing with a picnic and using the stage to prop you up. Magical to be so close. And one of London's best bargains. Wow - I'm envious of you seeing that performance. I was lucky too - at a similar age, I was introduced to Shakespeare as an actor! I played the lead role in a cut-down version of Henry V at the age of 11 in primary school. We went to see the Laurence Olivier film, and my mum, seeing something to be encouraged, took me to see A Midsummer Night's Dream in Regent's Park. The next birthday Book Token I received was spent on a Complete Works, and a lifetime passion was born. I do so agree about the Globe too.